Ian Rapoport of NFL Network is reporting that left tackle Donald Penn will not report to Oakland Raiders training camp on Friday. Penn has one year remaining on a two-year $11.9 million contract he signed in 2016. 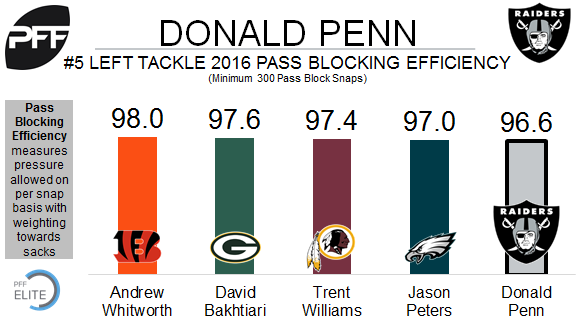 Penn joined the Raiders in 2014 and his PFF grade has ranked in the top 12 among offensive tackles each season. In 2016, Penn’s PFF grade of 86.3 was 12th out of 76 qualifying tackles. He allowed only one sack and 28 total pressures in 621 pass block snaps last season, and Penn’s 96.6 PFF pass-blocking efficiency (pressures allowed per snap with weighting toward sacks) ranked sixth among all tackles and fifth at left tackle.